LIC most trusted insurance Brand in India has launched My LIC Andriod App. This app is a replacement for old LICMobile App. This app provides all information about LIC products and services on fingertips. This app also provides options for viewing LIC products, premium payment, Premium comparison and many more features. It is declared that My LIC is an official Android app from Life Insurance Corporation of India. MyLIC is a play store of LIC which allows you to download and install three other micro apps of LIC, namely LIC Customer, LIC PayDirect and LIC Quick Quotes. Let’s take a look at MyLIC and LIC Customer app in detail. You can download and install My LIC app from Google Play Store. On the opening interface of this app, you will be able to see LIC App store with options to download three other micro-app of LIC. LIC Customer – View Policies, Premium Paid statement etc. Out of these three, LIC Customer app is a most useful app for LIC customers. 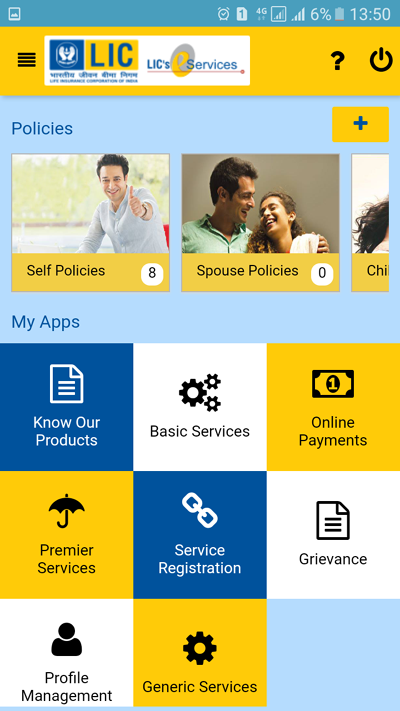 Key Features of LIC Customer App is given below. View Policies of self, spouse, and children. How to use LIC Customer App? After installing LIC Customer App, you need to select a language. This app is available in English and Hindi languages. If you are already registered portal user of LIC you can click on “Registered Portal Users”. Input your customer ID and password and press Sign In button. Once you sign in you will be able to see various menu items like basic services, online payment, service registration, profile management etc. In basic services section you will be able to see online payment receipts, premium calendar, policy status, claim status, loan status, and policy premium statement. You can avail any of the services on the move using this app. Under service registration, you will be able to track request status, online loan request, premier service registration and policies eligible for premier services. Profile Management allows you to update your profile including your marital status, occupation, annual income, family information, and address. This menu allows you to avail generic services of LIC like premium calculator, Doctor Locator, Office locator etc. More or less this app is a replica of e-service portal of LIC portal. LIC Pay Direct is a second Android app by LIC. LIC Pay Direct allows a customer to make payment without username, password, and registration. A customer can even view the status of payment done using pay direct option. App provides three steps process to make the payment. Customer validation, Premium particulars, and Payment. LIC Quick Quotes is an app for getting quick quotation about LIC plans. This app also provides detail information about all LIC plans like health, endowment, Term, whole life, unit-linked, pension etc. You need to input your name and age to calculate premium of the policy. So, total four apps are now available from LIC. However, as per me, LIC Customer is only app that is required for customer of LIC. Do you use any of the LIC app mentioned above? If yes, do share your views in the comment section. Is it possible to claim the maturity amount with this app.? No you can not claim maturity amount from this app.